Dr John Stevens is Chairman and CEO of HeartFlow Inc. He is an adult and paediatric cardiac surgeon by background and received his MD from Stanford University School of Medicine, where he later became Assistant Professor of Cardiothoracic Surgery. He has extensive experience founding and leading technology focused companies. In 1991 he founded Heartport, a minimally invasive cardiac surgery company acquired by Johnson and Johnson for $81 million in 2001. In 2001, he co-founded Amp Resources, a renewable energy company acquired by Enel Green Power North America in 2007. Since then, he has co-founded several successful technology companies including Medibuy and APS. As well as his role at HeartFlow, Dr Stevens is currently Managing Partner at Headwaters Capital Partners and Director of Clene Nanomedicine Inc. The HeartFlow FFRct Analysis involves a CT angiogram and a process of deep learning that creates a 3D model of the patient’s heart and arteries. Computer algorithms then solve complex equations to simulate blood flow and assess the impact of blockages within the arteries. With this technology, you can confirm the presence or absence of cardiovascular disease and work out disease severity and how to treat accordingly. How long does it take to get a result that a clinician can act upon? It depends on the urgency. In the Emergency Department pilot programmes we are rolling out at the moment, it takes 4 hours. We aspire to reduce this to 2-2 ½ hours. Outside the trial environment, typically we have a result by the next morning. 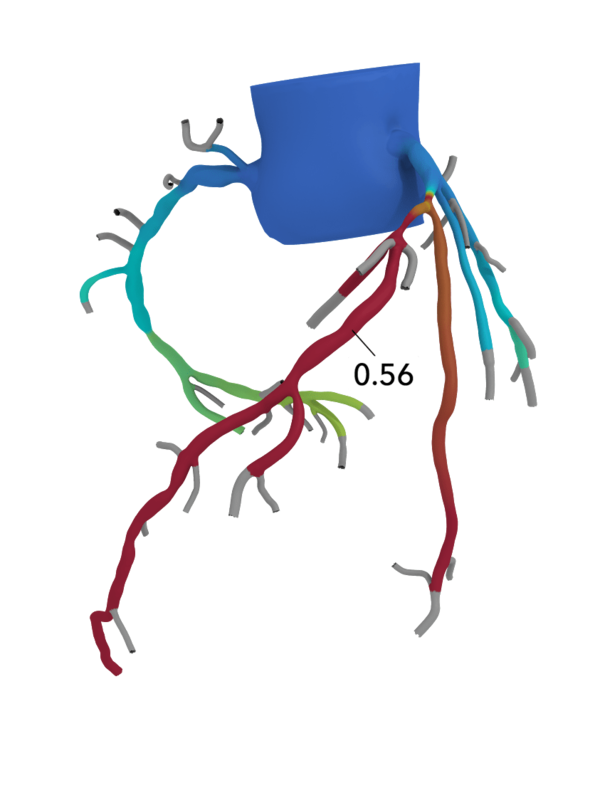 Heartflow FFRct Analysis can create a 3D model of a patient’s arteries to determine the presence and impact of artery blockages. Where did the idea for HeartFlow FFRct Analysis come from? It all started a long time ago. Charlie Taylor (now chief technology officer) and Chris Zarins (co-founder) laid the foundations when they were at Stanford University. They wanted to solve the problem: “How do you answer clinical questions about blood flow and pressure using computational methods and engineering?” Decades on and lots of grant funds later, here we are. It is often said that fundamental to the success of an idea is the team. You have the likes of Phil Mui (former head of Google Analytics) on board. How did you go about building your team? I agree with John Doerr, a leading venture capitalist in the valley, who advocates choosing three things for a successful startup: a big market, an unmet need and a spectacular team. You need the best people in the world to do their thing. You need to give them something to grasp onto and run with. Any advice to others looking to grow theirs? Growing a successful team in the world of computer science is a very competitive and complex field. Why would they want to work for a little startup when they could be earning far more working for something bigger? The answer is that they like the people they work with and love the problem that they are solving. You need the best people in the world to do their thing. Congratulations on recently gaining positive National Institute of Clinical Excellence (NICE) guidance for the FFRct Analysis. This is known to be a challenge. What were the main barriers to entry? And how did you overcome them? At the end of the day, it is all about data. Let the data tell the story. If your product is not in world-class peer-reviewed literature, it is not going to be considered. We have invested tens of millions of dollars in clinical trials and built a product that solves a big clinical problem, and the data shows this. Do you have any advice for someone planning to sell a product to the UK National Health Service? Don’t shy away from the big problems – we are so far behind in medicine. Don’t be bashful. Follow your passion and do it, because the world needs it. What are the advantages of the ‘subscription for access’ business model for HeartFlow? Healthcare providers pay for the HeartFlow FFRct Analysis only as it is used, ensuring that no unnecessary cost is added to the system. In addition, because we are able to incorporate the learnings from anonymous patient data, we are able to continuously improve our deep learning algorithm, in turn improving our product. You were Assistant Professor of Cardiovascular Surgery at Stanford University. How have you managed to juggle clinical work and entrepreneurship? I loved being a cardiac surgeon, but I have now moved away from clinical medicine to create a more substantial impact. I also believe patients deserve cardiac surgeons who are full time and at peak of performance. I really don’t think you can run a substantial company well and practice as a cardiac surgeon. I continue to follow my true passion, what I care most about, and that is my love for patients. Patients come first in every conversation we have at HeartFlow. Not all your entrepreneurial ventures have been health focused. What lessons have you learned from non-medical entrepreneurial adventures that you have been able to apply to the health startup scene? At Recurrent Energy (acquired by Enel SPA), I learned how to use computing as a core part of business. I also learned how to manage a team and form partnerships. During this time, we formed a strategic partnership with Siemens. That took two years of tough negotiation. HeartFlow just announced a strategic collaboration agreement with Siemens Healthineers and is due to announce additional strategic partnerships in the coming months. You have founded, invested in and led successful tech companies. What do you think the future trends are for tech in healthcare? Lower total costs for the entire healthcare system. This is where the future trend of healthcare lies – solving clinical problems in a way that reduces cost and improves care. We are not talking about a widget that does not transform care or gain wide adoption. We are talking about true transformative innovation. There is a crisis in healthcare funding across the world, and we need to improve outcomes at a reduced cost. This is where the future trend of healthcare lies- solving clinical problems in a way that reduces cost and improves care. Which startups or entrepreneurs in the health space are you particularly excited by? I am excited by well-done science and thoughtful people solving big clinical problems. Penumbra is an example of an exciting, data driven company. What is the next stage for HeartFlow? Could the same technology be used, for example, in peripheral vascular disease? Yes, for sure. Our intellectual property covers it, and the science covers it. Next steps are to focus on commercialisation and build the adoption of the HeartFlow FFRct Analysis globally. We need to scale the product as it can and should be scaled. Next steps are to focus on commercialisation and build the adoption of HeartFlow FFRct Analysis globally.